You don’t have to feel this way. There is help. You can cope with suicidal feelings and thoughts. They are not your fault and they do not have to continue. Don’t give in. Don’t lose hope. There is help. Call (800) 442-HOPE. Call a member from my support group. Remember that when I feel suicidal, my brain is lying to me and making things seem worse than they are. Remember to take any prescribed medication and stick with my treatment plan. Have someone take away my car keys and anything I could use to hurt myself. Go to a hospital if necessary. Remember that my life is valuable and worthwhile, even if it doesn’t feel that way now. If depression or bipolar disorder (also known as manic depression) affects you or someone you care about, you know that one symptom of these illnesses may be feelings of hopelessness and thoughts of suicide. If such thoughts occur, there are ways to respond with strength and courage. Suicide can be prevented with the right kind of care, treatment, and support. Mood disorders are medical conditions caused by changes in the chemistry of the body and brain. Depression and bipolar disorder may cause symptoms such as intense sadness, hopelessness, low energy, loss of appetite, changes in sleep patterns, inability to concentrate, decreased ability to perform one’s usual tasks, loss of interest in once-enjoyed activities and thoughts of death or suicide that can be difficult to ignore or overcome. Depression and bipolar disorder are treatable with medication, psychotherapy, support from others and changes in lifestyle. With the right treatment, all symptoms can improve, including suicidal thoughts. The act of suicide is often a desperate attempt to control the symptoms of a mood disorder. During a severe depression or mania, a person has little or no control over painful and disturbing thoughts and feelings. These are symptoms of the illness, not a part of a person’s true self. There are many different medications and therapies available for successful treatment. Treatment can be effective in reducing and preventing mood disorder symptoms. Finding the right treatment may take time. Different people respond differently to medication and therapy. Medication usually takes two to four weeks to reduce symptoms and may take several more weeks to provide complete relief. Some people need to try more than one medication or combination of medications before they find the one that works best. Keep this in mind as you work with your doctor to develop a treatment plan and stick with it. Never stop taking your medication without first discussing it with your doctor. Don’t get discouraged if your symptoms come back. Brief re-occurring episodes of depression should not threaten your recovery if you keep in touch with your health care professional, work to find the right treatment plan, and follow that plan. your mind is lying to you. If you are thinking of suicide, it is important to recognize these thoughts for what they are: expressions of a treatable medical illness. They are not true and they are not your fault. Don’t let fear, shame or embarrassment stand in the way of communication with your physician, therapist, family, or friends; tell someone right away. Know that you can get through this. Promise yourself you will hang on for another day, hour, minute, or whatever you can manage. It’s very helpful to have a plan of action ready before thoughts of suicide occur. Stay in contact with your doctor. Always have your doctor’s phone number with you— an office number as well as a pager or after- hours number—and a back-up number such as an emergency room or suicide crisis line like (800) 442-HOPE. Stay in contact with trusted friends. Develop a list with phone numbers of dependable family members and friends who can give you support during a crisis. Keep the list with you. Make a Plan for Life (see page 16 for an example) and promise yourself that you will follow it when you start to have suicidal thoughts. Give a copy of your plan (including your list of phone numbers) to family and friends before it’s needed, so they can be prepared to act quickly if needed. Recognize symptoms for what they are. With your doctor, therapist (counselor) or trusted friends, identify the symptoms you are likely to experience when your illness is at its worst. Always remember: feelings are not facts. Suicidal feelings are not your fault; they are a symptom of your illness.They may not seem temporary, but they are. As you learn to manage your illness, you will be able to spot your warning signs sooner and get help earlier. Write down your thoughts. Spend a little time each day writing down your thoughts about the things and people you appreciate and value in your life, and your hopes for the future. Read what you’ve written when you need to remind yourself why your own life is important. Connect with other people socially. When you are feeling suicidal, don’t be alone for long periods of time. Visit family and friends who are caring and understanding, even if it’s difficult. Attend support group meetings where you can meet others who understand what it’s like to live with a mood disorder. There is more about support groups on page 14. Avoid drugs and alcohol. Many suicides result from sudden, uncontrolled impulses. Since drugs and alcohol can make you more impulsive, it is important to avoid them. Drugs and alcohol can also make your treatment less effective. Know when it’s best to go to the hospital. There may be times when your illness becomes so severe that hospitalization is the best way to protect your health and safety. Discuss this possibility and your options with your doctor before the need arises. Understand your health coverage. Know whether your insurance, HMO, Medicaid or Medicare plan provides psychiatric hospitalization coverage, and how much. Keep copies of policy numbers and important health care information in an easy-to-find place. If you don’t have insurance coverage, find out what other options you have, such as community or state-run facilities. Keep yourself safe. Make sure you do not have access to weapons or anything you could use to hurt yourself. Have someone hold on to your car keys when you are feeling suicidal.Throw away all medications you are no longer taking. Give yourself time to get better. When you are first treated, or when you have recently had a severe depressive or manic episode, give your brain and body time to heal.Allow yourself to take life a little more slowly, and don’t get discouraged if you aren’t up to your previous activity and lifestyle levels right away.With continued treatment, you can feel better. You cannot make someone suicidal by asking straightforward, caring questions. With courage and understanding, you can help a friend or family member overcome thoughts of suicide. If you are prepared and informed, you will be better able to help. It is extremely important for people with mood disorders to receive early, quality treatment from health care professionals. If you believe someone close to you has serious depression, help that person find and stick with effective treatment. Be supportive, reassuring and willing to talk about suicidal feelings and thoughts. Take any mention of death or suicide seriously. If someone you know talks about suicide, asking direct questions about how, when, and where he or she intends to commit suicide may help prevent the attempt. It’s natural to fear that a question about suicide may anger or offend someone you care for—or even that it may put the idea of suicide into a person’s mind. However, you cannot make someone suicidal by asking straightforward, caring questions. A person considering suicide may welcome the chance to talk about these feelings. Take any mention of death or suicide seriously. Unbearable feelings: Depression causes some people to have powerful, extreme feelings of hopelessness, despair and self-doubt. The more intense these feelings become, and the more often they are described as “unbearable,” the more likely it is that the idea of suicide may enter the person’s mind. Rehearsing suicide, seriously discussing one or more specific suicide methods, purchasing weapons and collecting large quantities of medication are all signs. Even if the person’s suicidal thoughts seem to come and go, it is important to step in early and help. Drug or alcohol abuse is often a separate, treatable condition that must be addressed along with the mood disorder in order for treatment to be successful. Intoxication may cause impulsive behavior and make a person more likely to act on suicidal thoughts. Isolation: If a person seems determined to cut off friendships and social connections, there is a chance that the person might be experiencing serious depression and/or preparing for suicide. Sudden sense of calm:A person with a mood disorder may be most likely to attempt suicide just when he or she seems to have passed an episode’s lowest point and be on the way to recovery. If a person who was recently feeling upset or hopeless suddenly seems very calm and settled, it may be a sign that he or she has decided on a plan. The feelings and actions mentioned on page 8 are some signs that a person may be considering suicide. Anyone might have suicidal thoughts at any time, but there are certain groups of people who may be at higher risk. Older adults are at a higher risk because of the many stresses they may be facing, such as loss of loved ones, lifestyle changes, moving to assisted living facilities, loss of physical independence, or other illnesses. Sometimes other illnesses or medications can cause or mimic symptoms of depression, so it’s important for older adults to have complete physical examinations if they seem to have depression or suicidal thoughts. Watch for signs such as preoccupation with death, increased visits or calls, hopeless statements, or refusal to follow doctors’ orders for medication or diet. Young people may be at a higher risk because of family and school pressures, major life changes and hormonal changes. Watch for signs like deliberate self-harm (such as cutting), reckless behavior, frequent “accidents,” talking or joking about death, aggression, rage, impulsive behavior, running away from home, perfectionistic behavior, and other problems such as eating disorders or alcohol/substance abuse. People who have recently had a major loss or life change: It is normal to experience grief after a loss or need time to adjust to a major change, but if a person’s mood remains constantly down for several weeks and the person shows other symptoms of depression, there may be a more serious problem. Watch for major changes in attitude, changes in eating or sleeping habits, loss of energy, loss of interest in things once enjoyed, or statements about feeling worthless or wanting to escape. People who are recovering from an episode of depression or have attempted suicide before: If the person has attempted suicide before and seems to be showing signs of depression, falling back into old habits such as isolation, or refusing to take medication or follow a treatment plan, the person may be at risk. Studies have shown that people who have been hospitalized for depression are most likely to consider or reconsider suicide six to 12 months after hospitalization. No matter who the person is or what the signs may be, if you are worried about someone, talk to that person, or his or her family or doctor as soon as you can. Don’t promise confidentiality. Support your loved one in getting professional help. Express understanding and concern. Severe depression usually causes a self-absorbed, uncommunicative, withdrawn state of mind. When you try to help, the person may be unwilling to talk. At such times it is important to let the person know you understand the reality and severity of the painful and hopeless feelings. If the person is not comfortable talking with you, encourage him or her to talk with someone else. Describe specific behaviors and events that worry you. Don’t be afraid to point out particular ways the person’s behavior has changed, or things that lead you to think he or she may be considering suicide. Try to help him or her overcome feelings of guilt.Your friend or family member may be unwilling to communicate because of guilt or shame over the depression and suicidal thoughts. Remind the person that he or she is not alone, and that guilt is also a treatable symptom of the illness. Stress that the person’s life is important to you and to others. Remind the person in specific terms why his or her life is important to you and makes your own life better. Don’t take responsibility for making the person well. Be supportive and encouraging as you help the person find professional treatement and stick with it. During hospitalization, you can support someone by making regular visits or calls, and offering to take care of the person’s errands, home, children or pets. Support the person as he or she recovers and help him or her stick to a treatment plan, make a Plan for Life, and connect with a support group. Remind the person there is help and hope. Don’t try to handle the crisis alone. Take the person seriously. Stay calm and let the person know you are willing to listen. Involve other people. Don’t try to handle the crisis alone or put yourself in danger. 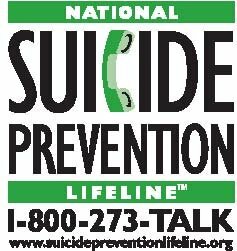 Get help from a suicide hotline, or call 911 if necessary. Contact the person’s family, psychiatrist, therapist or others who are trained to help. Express concern. Ask direct questions and listen. Try to find out if the person has a specific plan for suicide and what it is. Be understanding, not judgmental. Remind the person that suicide is a permanent solution to a temporary problem, and that there is help and hope. Never promise confidentiality. You may need to speak to the person’s doctor in order to protect the person. Secrecy can endanger your loved one’s life. If possible, don’t leave the person alone until you are sure he or she is in the care of professionals. It takes courage to help a person who is considering suicide. If the person is also abusing drugs or alcohol or is verbally or physically abusive, helping may seem impossible.You may have correctly decided that you cannot tolerate this behavior and want to keep your distance. However, even if you keep your distance or live far away, you can still help by informing the person’s doctor or another friend or family member who lives nearby, of the person’s suicidal thoughts. People with severe depression–no matter how unreasonable or angry they become–need help finding help. When you are helping someone else, it is also important to take care of yourself.You may be feeling many difficult emotions as you support someone close to you who is considering suicide. Be honest with yourself about your own feelings, and be sure to let yourself feel them. Don’t be afraid to ask for help. Even if you are not severely depressed, therapy and support from your family and friends can help. Give yourself time to grieve.You may have overwhelming feelings of anger, guilt, confusion, sadness and forgetfulness, as well as physical aches and pains or trouble eating or sleeping. Allow yourself to feel these things and know that they are normal reactions.Try not to make any major changes in your life right away. Get support.Talk to other friends and family members about what you are feeling. Find a support group for survivors. Don’t be afraid to seek professional help to get you through this difficult time. You may even have suicidal thoughts. If you do, get help right away. Don’t blame yourself.You may have thoughts such as “What if I had done this?” or “Why didn’t I say that?” A mood disorder is not the fault of the person who has it, or of anyone else, and no one is the sole influence in another person’s life. Know that this was not your fault.Allow yourself to feel angry at the person or at yourself, but work to forgive yourself and the person, too. Reach out to others. When you are honest about how you feel and what you are going through, you can help others who are having similar experiences. Provide a safe and welcoming forum for mutual acceptance, understanding and self-discovery. Help them rediscover their strengths and humor.Contact DBSA to find a support group near you or learn more about starting one. Take the next step toward wellness for yourself or someone you love. There is help, and there is hope. The following organizations also offer information and/or assistance with mood disorders and related topics.While you may find additional support from these organizations, DBSA assumes no responsibility for the content or accuracy of the material they provide. Please help us continue our education efforts. We hope you found this booklet helpful.Your gift will help us continue to distribute this information and assist people with mood disorders in preventing suicide. Please fill in and mail the donation form below, call (800) 826-3632 or visit www.DBSAlliance.org for details. ❏ I wish my gift to remain anonymous. ❏ Please send donation envelopes to share. ❏ I’d like details on including DBSA in my will. ❏ I have enclosed my company’s matching gift form. ❏ I’d like to receive more information about mood disorders. ❏ Please send all correspondence in a confidential envelope. Questions? Call (800) 826-3632 or (312) 642-0049.
Credit card payments (Visa, MasterCard or Discover) may be faxed to (312) 642-7243. Secure online donations may also be made at www.DBSAlliance.org. DBSA is a not-for-profit 501(c)(3) Illinois corporation.All donations are tax deductible based on federal and state IRS regulations. Please consult your tax advisor for more details.All information is held in strict confidence and will never be shared with other organizations. The Depression and Bipolar Support Alliance (DBSA) is the leading patient-directed national organization focusing on the most prevalent mental illnesses. The organization fosters an envi- ronment of understanding about the impact and management of these life-threatening illnesses by providing up-to-date, scientifically-based tools and information written in language the gener- al public can understand. DBSA supports research to promote more timely diagnosis, develop more effective and tolerable treatments and discover a cure. The organization works to ensure that people living with mood disorders are treated equitably. Assisted by a Scientific Advisory Board comprised of the leading researchers and clinicians in the field of mood disorders, DBSA has more than 1,000 peer-run support groups across the country. Nearly two million people request and receive information and assistance each year. DBSA’s mission is to improve the lives of people living with mood disorders. This brochure was originally prepared in consultation with DBSA Scientific Advisory Board (SAB) members Peter C.Whybrow M.D., Robert M.A. Hirschfeld, M.D., Jan Fawcett, M.D., and Martin B. Keller, M.D. ; and with David Clark, Ph.D., Margaret Duthie, and Nancy Scheff. Revisions were reviewed by SAB member John March, M.D., of Duke University and by Diana Nielsen, Dolores Beeso, Rita Cronise and Paul Schultz. DBSA does not endorse or recommend the use of any specific treatment or medication for mood disorders. For advice about specific treatments or medications, individuals should consult their physicians and/or mental health care providers. ©2003 Depression and Bipolar Support Alliance EB 3007 Models used for illustrative purposes only. The C-SSRS is a questionnaire used for suicide assessment developed by Kelly Posner, PhD, David Brent, MD, Chris Lucas, MD, Madelyn Gould, PhD, MPH, Barbara Stanley, PhD, Greg brown, PhD, Prudence Fisher, PhD, Jaime Zelazny, NR, MPH, Ainsley Burke, PhD, Maria Oquendo, MD, and J. John Mann, MD.